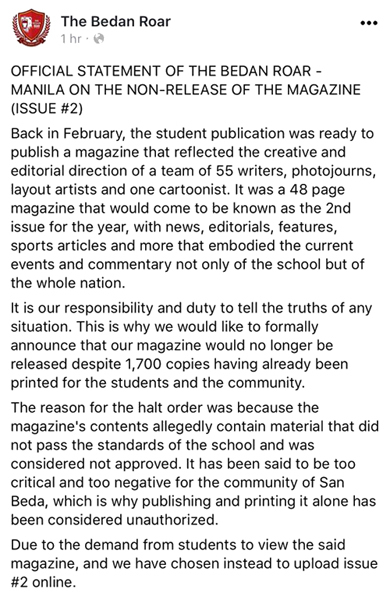 "Pro-Truth" High School Publication Banned for Being "Too Critical"
These Grade 12 students are #woke AF. (SPOT.ph) Journalists around the world celebrated bold reporting and courageous exposés during the announcement of winners of this year's Pulitzer Prizes. A Filipino journalist and his colleagues at Reuters were recognized for their "relentless reporting that exposed the brutal killing campaign behind Philippine President Rodrigo Duterte's war on drugs," the staff of The Cincinnati Enquirer were applauded for their "riveting and insightful narrative and video documenting seven days of greater Cincinnati's heroin epidemic," and photographer Ryan Kelly was awarded for a "chilling image" of a "racially charged protest in Charlottesville, Virginia." 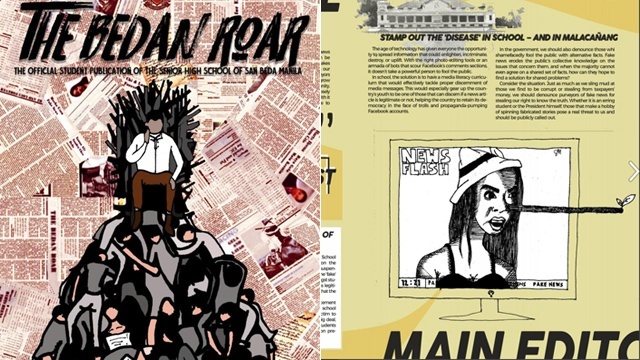 Here in the Philippines, the second issue for academic year 2017-2018 of The Bedan Roar—official senior high school publication of San Beda University - Manila—was pulled out for being "too critical and too negative for the community of San Beda." An official statement released by The Bedan Roar online, which has now been removed, described the publication as an issue that "embodied current events and commentary not only of the school but of the whole nation." According to the statement, it was ready to be published in February, with 1,700 copies already printed. The 48-page magazine was put together by a team of 55 writers, photojournalists, layout artists, and a cartoonist. A teaser on The Bedan Roar Facebook page announced what could have been the release of the said issue by April 4. 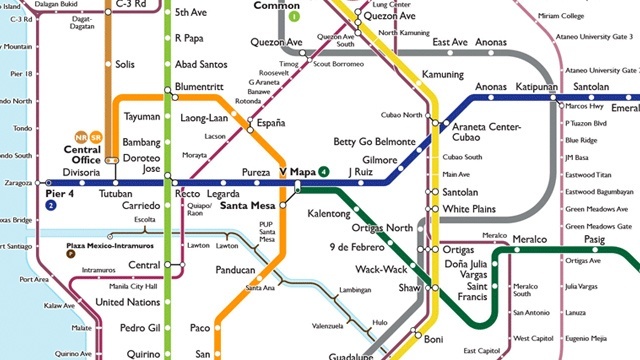 This didn't push through because of a "halt order" by the administration of San Beda University with the reason that its contents "allegedly contain material that did not pass the standards of the school and was considered not approved." The cover of the magazine issue, now available online through Issuu, depicts what seems to be a caricature of Duterte sitting on the Iron Throne (from the Game of Thrones) with dead bodies piled up on his feet. 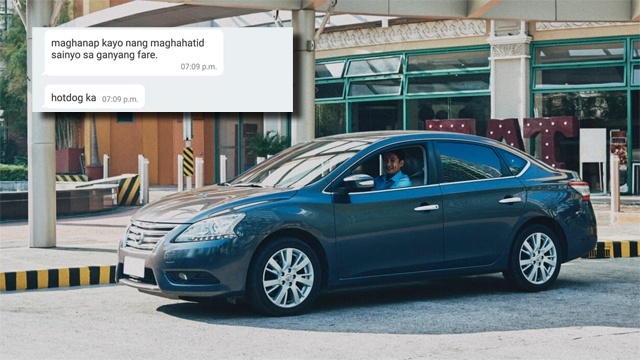 The editorial page talks about #FakeNews and explains that the "problem isn't just the multitudes of trolls and fake news websites that spread misleading information. It's that government officials don't take fake news seriously and sometimes, even become the source themselves. The next image shows an editorial cartoon of what looks like Presidential Communications Assistant Secretary Margaux "Mocha" Uson with a nose as long as Pinocchio’s. And we all know what that means. The Editor's Note indicates: "This is a fleeting representation of the open dialogue that should be allowed without condemnation, an incredible, poignant, and straightforward discussion in celebration of students that they, too, have an opinion and voice about the topics that are currently flooding their surroundings, and that each of them have something relevant to add to the conversation. And yet, as always, it's a double edged-sword." This rumination seems to be a foreshadowing of what's next to come for the paper: "[...] today, this invites extreme danger not only from the strongman, who has his finger on the trigger, but above all, from his trolls and fanatical supporters, who could be more prone to bullying than their idol." An article titled "Game Changer" questions Duterte's citation as "Bedan of the Year" in 2017. It points out what a true Bedan is: "Fully human, wholly Christian," as enshrined in the school's mission-vision statement. "This is not the case for Rodrigo Duterte, whose entirery has turned the tables; changed the way how politics must be played and how power can be exercised without wise discretion," he concludes. The amount of respect I have for these senior high school students who made the issue for The Bedan Roar is overwhelming. To write is actually a huge step knowing how fascist the state is, but to actually publish it is one big story and move. Mad mad respect. 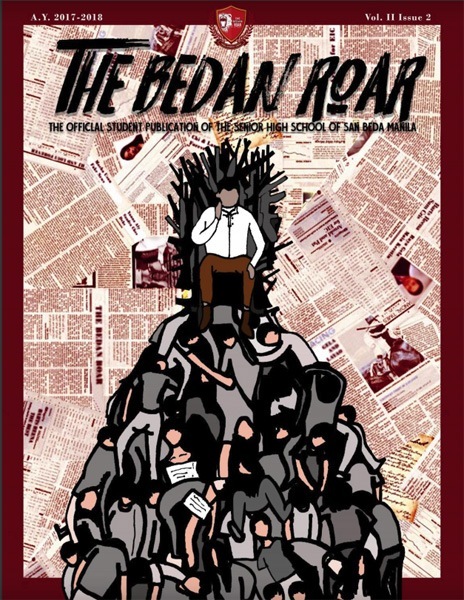 This bold move earned the respect and support of fellow campus journalists from other schools, including the editorial board of The Bedan Roar of San Beda College Alabang Senior High School. 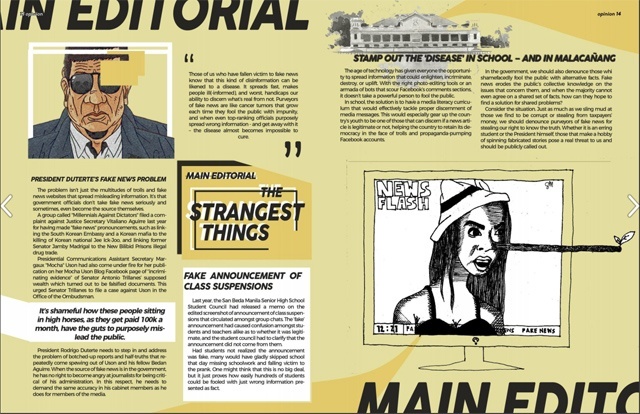 In a statement, the sister publication thanked the group “for never letting [their] roar be silenced.” The College Editors Guild of the Philippines, Tomasino Web, as well as other students and even media practitioners also approve of this unyielding hunt for the truth (as well as display of artistry and command of language) from their younger colleagues. UPDATE (April 26, 10:30 a.m.): Names and social media accounts withheld upon request of The Bedan Roar editors.